The last time Drew Barrymore had a prominent place on television, it was back in 1992 for the extremely short-lived CBS drama 2000 Malibu Road. 24 years later, she’s finally ready to head back to the small screen for what legitimately sounds like it could be her best project in quite a long time. Barrymore has been tapped as a lead in the newly announced Netflix comedy Santa Clarita Diet, in which she will star opposite Justified’s Timothy Olyphant. How the hell does Netflix keep amazing us like that? Santa Clarita Diet secured a series order from Netflix, which aims to get the comedy to its millions of worldwide subscribers at some point in 2017. In the show, Barrymore and Olyphant will respectively play married real estate agents Sheila and Joel. Their suburban lives in Santa Clarita aren’t exactly the happiest they could be, but that all changes when Sheila gets put through some kind of a grand life change that sends her and Joel down a dark and deadly path, but apparently in the best possible sense of those words. Whatever that entails. It’s not clear just how many episodes the single-camera comedy is going to get, but this is a case where we’re hoping Netflix goes for as many episodes as possible. Beyond the star power, Santa Clarita Diet is also worthy of mountainous expectations for being the latest series from TV vet Victor Fresco. If that name isn’t immediately familiar, maybe you’ll know him as the guy who created the two sub-cult comedies Andy Richter Controls the Universe and Better Off Ted, as well as Sean Saves the World. He was also a writer and/or producer on shows like My Name is Earl, Dinosaurs and Mad About You. Drew Barrymore has been pretty quiet on the acting front in recent years, taking on big screen roles for 2014’s Blended and last year’s Miss You Already. As far as TV work goes, she was in the Grey Gardens remake some years back, and she appears on Family Guy every so often. 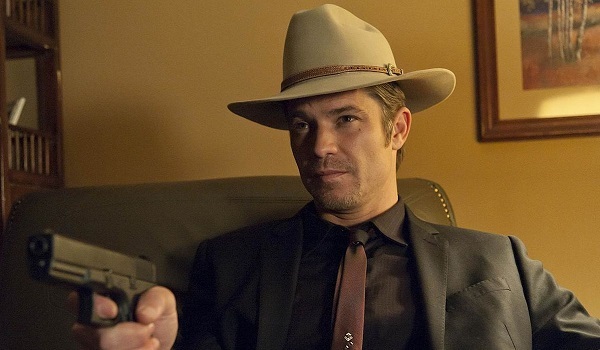 Timothy Olyphant, an actor we wished would never stopped playing Raylan Givens, already nabbed another memorable TV role for himself recently in a series of guest spots on The Grinder. As far as features go, he’ll be seen later this year in the drama Behold My Heart, Garry Marshall’s ensemble comedy Mother’s Day and Oliver Stone’s biopic Snowden. And with any luck, we’ll see him reprising the role of Seth Bullock for the better-be-happening Deadwood reunion movie. It’s been a big day for Netflix, as the company released both Season 2 of Daredevil and the first teaser for the upcoming Marvel drama Luke Cage. I never would have expected the day to also include news about a potentially superb new comedy from Drew Barrymore and Timothy Olyphant, but I’ll take it with open arms, since it’ll almost definitely get more episodes than Andy Richter Controls the Universe did.